The Pittsfield Township Historical Society is seeking old tools and implements as well as household and kitchen items that were important to the life of this community between 1824 and 1900. Specifically, the society is seeking an early mechanical rope maker. We would like to demonstrate the rope-making process at local exhibits and programs by making jump ropes for children. For similar demonstration purposes, we are seeking an early mechanical wire fence weaver. 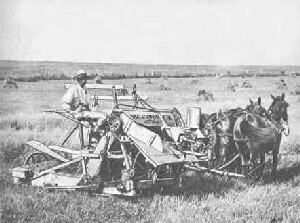 Also, the society is looking for early farm equipment, such as a prairie plow and a McCormick Reaper (shown at right). If you have an object to donate, please contact members of the board.